Publisher's blurb: "Over 200 creeps, critters, and creatures keep players on their toes. 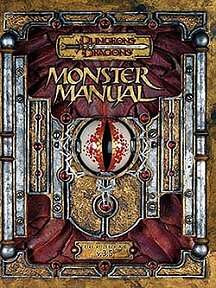 From aboleths to zombies, the revised Monster Manual holds a diverse cast of enemies and allies essential for any Dungeons & Dragons campaign. There are hundreds of monsters ready for action, including many new creatures never seen before. The revised Monster Manual now contains an adjusted layout that makes monster statistics easier to understand and use. It has 31 new illustrations and a new index, and contains expanded information on monster classes and playing monsters as heroes."